Reflow soldering is the most widely used method of attaching surface mount components to printed circuit boards (PCBs). The aim of the process is to form acceptable solder joints by first pre-heating the components/PCB/solder paste and then melting the solder without causing damage by overheating. There are various types of reflow soldering machine available depending on the required line speed and design/material of the PCB assemblies to be processed. The selected oven needs to be of a suitable size to handle the production rate of the pick and place equipment. 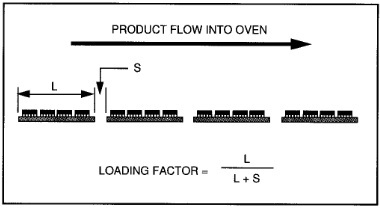 To be able to select the correct size reflow oven the process speed (defined below) must be greater than the minimum calculated line speed. An SMT assembler wants to produce 8-inch boards at a rate of 180 per hour. 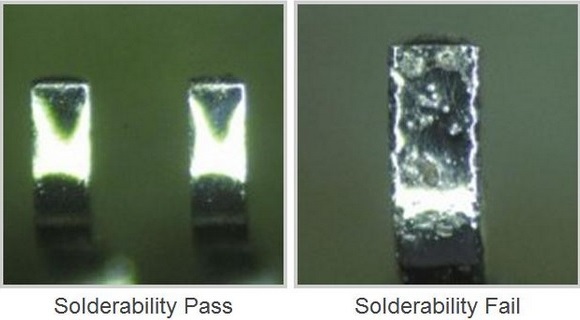 The solder paste manufacturer recommends a 4 minute, three step profile. How long an oven do I need to process boards at this throughput? Therefore, the reflow oven must have a process speed of at least 30 inches per minute. Note that the overall length of the oven will exceed 10 feet including the cooling section and conveyor loading sections. The calculation is for HEATED LENGTH – NOT OVERALL OVEN LENGTH. 1. Conveyor type – It is possible to select a machine with mesh conveyor but generally edge conveyors are specified to enable the oven to work in-line and be able to process double sided assemblies. In addition to the edge conveyor a centre-board-support is usually included to stop the PCB from sagging during the reflow process – see below. When processing double sided assemblies using the edge conveyor system care must be taken to not disturb components on the underside. 2. Closed loop control for speed of convection fans - There are certain surface mount packages such as the SOD323 (see insert) which have a small contact area to mass ratio which are susceptible to be disturbed during the reflow process. Closed loop speed control of the convention fans is a recommended option for assemblies using such parts. 3. Automatic control of conveyor and centre-board-support widths – Some machines have manual width adjustment but if there are many different assemblies to be processed with varying PCB widths then this option is recommended to maintain a consistent process. In order to create a reflow profile thermocouples are connected to a sample assembly (usually with high temperature solder) in a number of locations to measure the range of temperatures across the PCB. It is recommended to have at least one thermocouple located on a pad towards the edge of the PCB and one thermocouple located on a pad towards the middle of the PCB. Ideally more thermocouples should be used to measure the full range of temperatures across the PCB – known as ‘Delta T’. Within a typical reflow soldering profile there are usually four stages – Preheat, soak, reflow and cooling. The main aim being to transfer enough heat into the assembly to melt the solder and form the solder joints without causing any damage to components or PCB. Preheat – During this phase the components, PCB and solder are all heated to a specified soak or dwell temperature being careful not to heat too quickly (usually no more than 2ºC/second - check solder paste datasheet). Heating too quickly can cause defects such as components to crack and the solder paste to splatter causing solder balls during reflow. Soak – The purpose of this phase is to ensure all components are up to the required temperature before entering the reflow stage. Soak usually lasts for between 60 and 120 seconds depending on the 'mass differential' of the assembly and types of components present. The more efficient the heat transfer during the soak phase the less time is needed. Reflow – This is the stage where the temperature within the reflow oven is increased above the melting point of the solder paste causing it to form a liquid. The time the solder is held above its melting point (time above liquidus) is important to ensure correct ‘wetting’ occurs between components and PCB. The time is usually 30 to 60 seconds and shouldn’t be exceeded to avoid the formation of brittle solder joints. It is important to control the peak temperature during the reflow phase as some components can fail if exposed to excessive heat. The use of nitrogen during the reflow process should be considered due to the trend of moving away from solder paste that contains strong fluxes. The issue is really not the ability to reflow in nitrogen, but rather the ability to reflow in the absence of oxygen. Heating solder in the presence of oxygen will create oxides, which are generally non-solderable surfaces. Cooling – This is simply the stage during which the assembly is cooled but it is important to not cool the assembly too rapidly - usually the recommended rate of cooling should not exceed 3ºC/second. See ‘Design for Manufacture’ for other considerations. The earlier process steps within surface mount assembly are critical to an effective reflow soldering process. 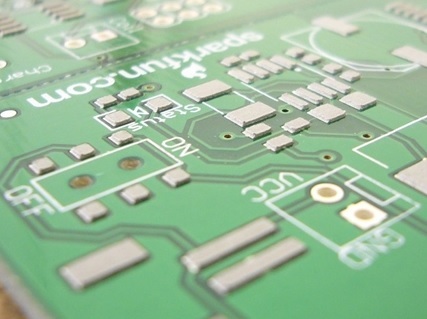 The solder paste printing process is key to ensure a consistent deposit of solder paste onto the PCB. Any fault at this stage will lead to undesired results and so complete control of this process along with effective stencil design is needed. The placement of surface mount components must be repeatable and so a reliable, well maintained pick and place machine is necessary. If component packages are not taught in the correct way it can cause the machines vision system to not see each part in the same way and so variation in placement will be observed. This will lead to inconsistent results after reflow soldering process. 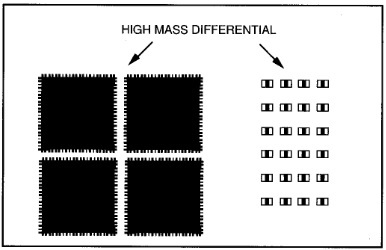 In a similar way the quality of the surface mount component leads can be poor depending on the manufacturing process and method of storage. The ideal reflow solder profile for each assembly does exist. The reflow soldering process can be time consuming to setup but is essential to ensure all components are fully soldered without being damaged. It is even more important when profiling a lead-free assembly due to the acceptable temperature range being reduced to that of a tin-lead assembly. Using a carefully designed profile will result in a repeatable process which will consistently deliver the required results - It is worth the extra time and effort.